Recently, I was roaming about on the internet as an unusual ad happened to catch my eye. 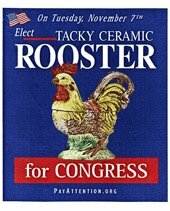 The ad looked like every other ad and sign you see to entice you to vote...except the canidate's name happened to be Tacky Ceramic Rooster. < sidebar>I only noticed this because I once had a tacky ceramic rooster that I received as a gift and hated then fell in love with...then it got broken. I have been on the hunt for one ever since. I found it most humorous (and I enjoy a good laugh)...and enlightening. The point of the website is to help you pay attention to what you vote for. I then decided we (as a Christian people) should hijack this website to get Christians to pay attention. I keep coming across people in church that believe some crazy stuff. They haven't paid attention to the God of the Bible or the inerrancy of His Word. So, they vote for pretty colors and feel good things. That's my rant. Why aren't we paying attention? *We do not actually condone hijacking of any sort. 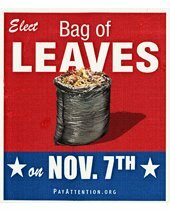 I have always wanted to learn more about politics... and well vote... for something that I'm educated about. Well, I say vote for "Side of Hashbrowns." He has teamed up with ketchup to take over breakfast menus all across America. Come! See my tacky ceramic roosters! Leftover from the era of my mother in law! and forced upon me in my country kitchen. I don't mind them so much anymore. I can't wait to check out this 'payattention.org'. I hope that 'side of cream gravy' is on the ticket with 'side of hashbrowns'. They really do need each other to make an impact. I love your roosters! 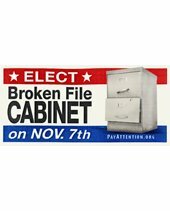 Now one of them is running for office. 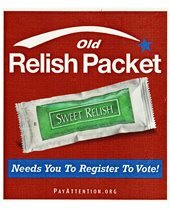 "Side of Hasbrowns" did turn down "Mustard" as his running mate, so we'll see what happens.